The media has reminded me all week about the uniqueness of today’s date – and the fact that it falls on a weekend for new brides to secure as a magical wedding anniversary. I must admit, however, that when I wrote it this morning I was not thinking of the date’s special qualities but rather of the radio jingle of my youth when living in New York: 10-10 Wins. In either case – I hope that everyone experiences a beautiful fall Sunday. This has been a good week. I define “good” as nothing out of the ordinary happened, lesson plans worked well, student issues were kept to a minimum, and nightly grading was manageable which allowed for some much-needed down time. I am still crazy enough to consider participation in NaNoWriMo in November, so much of my evening activities have centered around preparation for that event. I have researched online successful NaNoWriMo tips and I have tried to read a bit of plot development and character sketch exercises. In addition, I mentioned the idea of organizing a student NaNoWriMo event at my school and I think I might have about six or seven students join me in this insanity. As you can tell, I am a little singularly focused at the moment. As I mentioned above, this was a good week in all classes, but two class periods were particularly rewarding. I am thrilled to see that my 8th grade class is starting to release their inhibitions and starting to embrace their inner Shakespeare. On Wednesday I had each student select any character – any speech (as long as it was a minimum of 6 lines) and rehearse those lines for 10 minutes. The goal was to perform “over the top” in front of the class. WOW — they did great!! I think hearing everyone else practice and strive to be “too much” gave them permission to let go and just have fun. Hopefully they all realized that if everyone feels “silly” and is uncomfortable, it takes the pressure off. In 9th Grade English I tried a new idea to help with literary discussions. I have one class that has a very difficult time staying on task. Some of the students can get off topic at the drop of a hat and bringing it around to the original question is a constant uphill battle. I read about this idea in the book, Speaking Volumes by Barry Gilmore – and adapted it slightly for my own needs. I took 4 large sheets of butcher paper and put a different discussion topic at the top of the page. I also included some suggestions for relevant discussions on that topic. For example, we are studying Fahrenheit 451 and the 4 main topics included: Happiness – Society – Foil Characters – and Writing Style. Each student received a different color marker (I only have 12 in a class, so this was not difficult) and were told to use that color the entire class period (this was so that I can monitor who said what – which encouraged full participation and appropriate comments). Students were divided into pairs (for the class of 8) and threes (for the class of 12) and given 10 minutes to “discuss” the topic. They were not allowed to talk, and they had to support their answers with textual references. After 10 minutes they moved to another sheet – given another 10 minutes to read the commentary already written, and begin their own discussion OR add to the previous conversation. This continued until every student had the opportunity to write their thoughts on each topic. Since we ran out of time, we will complete this activity on Friday. I will put the sheets of paper on the wall and we will analyze the discussion: the different conversations – questions raised that were not fully answered – and the legitimacy of this exercise. I was thrilled with the results – and hopefully the students learned that they can actually stay on task and still have fun. Well, as most of you know who are a part of the book blog universe — yesterday was the fall read-athon. I absolutely LOVE these focused weekends where hundreds gather privately to read, but share publicly in twitter conversations, reading challenges, and blog posts. I did not officially join this go around, but I did participate in my own small way (you can see my posts here, here, and here — if interested). While this was an unusual read-athon for me, it was exactly what I needed. And while I had hoped to make some progress with the RIP challenge, I did manage to make a book purchase in honor of that event. Half Price Books is having its annual teacher/librarian appreciation sale and I simply could not pass up that kind of opportunity. 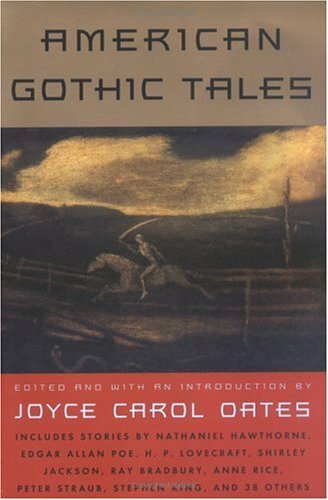 In browsing the clearance section I found a terrific anthology of American Gothic Tales which pairs quite well with the anthology of Victorian Ghost Stories I purchased in clearance a few years ago. Perhaps my buying habits are trying to tell me something: at this time in life I don’t have to read a full-length novel in order to participate — I can just read a couple of short stories to get into the thriller spirit of the season. BBAW candles . . . I am going to the mall in a little bit and you've convinced me to stop in there! I have begun Chrustmas shopping too but haven't gotten too far yet. Just struck by what an amazing teacher you are! Love how you turned the challenge of your 9th grade class into such an effective and creative form of discussion. If you ever wonder, you really are doing what you were meant to do! I adore your butcher paper idea. I'm going to use it tomorrow. I'll have to modify it to fit my class of 36 7th graders, but I think I can do it. They're in groups of 4 for book clubs, so I should be able to make it work using large pieces of "art" paper instead of butcher paper…..
Well, I can already see what I'll be doing today. I have said it before but will say it again…I wish Sam had you for his English teacher! You are amazing. By the way,it was fun to see your updates yesterday–I am glad you were able to participate in your own way. I love your TSS posts so much, Molly! I hope you'll be doing NaNoWriMo – it's wonderful that you're considering doing it with some of your students! And your butcher paper discussion idea with the different colored markers looks so interesting. I didn't have a chance to participate in the readathon yesterday, but it sounds like everyone had a great time! Sounds like a good find for your Christmas shopping. I'll forgive you for starting so early! And sounds like a rewarding week teaching too. We must have been on the same wavelength this week – I started my Christmas shopping at Bath and Body Works, too! I wish my kids had English teachers like you… sigh. I don't even the date today crossed my mind until just now, reading your post. Boy, am I out of it! I am glad you had a good week, Molly. And Christmas shopping already! I should have started a couple of months ago, but again I'm waiting until the last minute. I need to get started on that. I sure wish you'd been my English teacher in high school! You come up with the best ideas. Once again I'm impressed by your teaching–always so willing to try something new to adapt to the class dynamic that you have! And, once again, I'm so wishing my daughter could have you for a teacher who might be able to get her excited about reading. I am so pleased to read that you are joining in with NaNoWriMo. I am listed on there as viviennejane. I am presently working through my trial run, but I do need to organise my story for next month too. Sounds like you had a great week. I'm so impressed that you started your holiday shopping already. I haven't even bought my pumpkins or done any of my fall decor yet and now I'm heading off on a business trip for 8 days. I'm afraid that this year I will need to embrace being behind on everything! Wow, Christmas presents already. I guess it is time to start thinking about that. Ugh! I wish I was better at creative gift giving. I'm glad your classes are going well. I like the written discussions idea. Thanks for sharing your class activity. That brings back memories of my high school English class in which our teacher had a similar tactic. 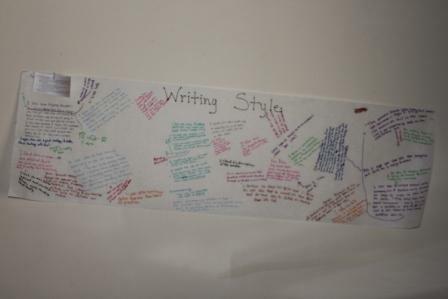 I miss the butcher paper on which we were to create visuals and comments pertaining to the novels we have discussed. I hope none of the administrative staff or teachers' aides at your school read your blog! LOL I'm glad you had a great week.